Fear responses to noises are a common problem and represent a serious welfare issue for dogs. It is customary for veterinary practices to produce displays outlining advice to owners for the firework period sometime close to the season. At this stage, advice typically includes building a den, plugging in an Adaptil diffuser and ignoring the dog if it seeks attention. But how useful are these tips just a few weeks before fireworks usually begin? How can these standard instructions be adjusted to maximise success in reducing fear responses and improving coping strategies in dogs? Research shows that almost 50% of dogs show a fear response to loud noises1,2. However, these figures are based on owners who report overt signs of fear and the likelihood is that far more dogs exhibit more subtle signs of fear towards loud, novel or sudden noises. Despite this, less than one third of owners who identified their dogs exhibited a fear of fireworks sought help3 – this may be due to the relatively seasonal nature leading to owners ignoring the problem, or because they are unaware help is available to them. One study also found that only 34% of clients were offered long-term behavioural therapy of any kind by their vet4. Veterinary staff have a responsibility in improving welfare by identifying fear-related behaviours in dogs, increasing awareness that treatment is available and effective in dealing with fears of loud noises, and referring owners to appropriately qualified behaviourists. Behavioural treatment of any kind should not begin until the dog has been physically examined by a vet – any medical condition that debilitates a dog or impairs its ability to cope could contribute to or exacerbate fear of noises, particularly orthopaedic pain5. Loud or sudden noises resulting in a startle response may cause muscle tension that exacerbates pain, or pain may lower the dog’s threshold for coping. There is also an increased risk of fear of noises with age1, which could be related to potential medical factors as dogs get older5, or could simply be due to increased exposure over time. In addition, cognitive dysfunction or sensory deprivation may affect how a dog responds to sudden, loud or novel noises6. Building a den – as simple as that? Advice provided by veterinary practices usually includes “create a den”. The location of the den should be one of the areas where the dog already chooses to hide when it is exposed to fireworks. This is often different to their usual bed/resting areas. 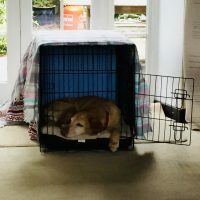 A common problem that occurs when owners have tried to encourage use of a den is that they choose an area that is convenient to them, rather than using information their dog has previously provided about where they feel the safest. It would be sensible to avoid conservatories or other rooms with poor noise insulation. Safety is paramount in the den area – owners must ensure that electrical wires are taped up and that there is nowhere the dog can get its legs stuck, for example. If it is not safe enough to turn the previously used bolt-hole into a den area, the properties of that bolt-hole should be mimicked as much as possible whilst making it sound proof (so ideally a solid roof and sides). Within the den, the dog should be provided with excessive amounts of bedding – thick old duvets and additional old towels or blankets for digging in. The dog must have the choice to enter and leave the den 24/7, providing them with a sense of control7 that reduces stress and helps the dog gain confidence to spend increasing amounts of time outside the den in the presence of fireworks. Once the den area has been created, it is vital that owners spend a period of time forming a strong positive association with the area. It is normally recommended to allow two weeks for this, but in my experience it requires much longer – use of the den should be a well-established habit before there is any exposure to fireworks. The dog should be trained to enter and then settle in the den, with activity feeders and chews that can be kept in the area – sniffing, chewing and licking in particular are arousal-reducing, endorphin-fuelled activities. Do pheromones resolve a fear response? Adaptil (the synthetic analogue of the pheromone that is associated with a perception of increased safety and security) can be used to increase the dog’s capacity to relax in a certain location. Use of Adaptil during training has led to dogs showing significantly greater use of a hiding box8. It enhances relaxation and a concept of security in and around the safe place7, encouraging use of the area. Dog owners should be advised to use Adaptil around the den area during the firework season, but it should be explained that the pheromone will encourage coping and choice and will not magically cure a fearful or phobic dog without behavioural therapy alongside its use. The diffuser should be placed as close as possible to the opening of the den and should be left on all the time. A preliminary stress response will elicit escape and hiding behaviours, and in social species such as dogs will also often result in social solicitation – seeking the company and attention of another social animal, usually the owner, intended to maximise their feeling of security9. Advice given close to firework period often entails ignoring the dog if it seeks attention due to concern of ‘reinforcing the fear’. However, emotions cannot be reinforced. Seeking reassurance actually reduces stress and helps dogs cope with the fear-inducing noises. There is also no evidence to support social transmission of human fear10. Although giving attention will reduce a dog’s anxiety in the short-term, it is not recommended as a long-term strategy. Reassuring a fearful dog reduces their stress, but may teach them to be dependent on their owner in order to cope with loud noises. This means there is a risk of separation-related behaviours if a dog is subjected to loud noises when the owner is absent. When fireworks night is imminent, it is important that advice is given NOT to ignore a frightened dog that is dependent on owner reassurance, as this will simply increase distress. Owners need to give dogs who seek reassurance as much comfort as required, get through the fireworks season, and then consider altering their dog’s coping strategy11. Anxiolytic drugs should not be used on a long-term basis or year-after-year unless the owner is also attempting to modify the underlying fear – if temporary improvement is observed, it can lead to owners disregarding their dog’s welfare problem for another year. In the short-term, medication may be used to reduce acute responses to fireworks or to induce amnesia – alongside recommendation for long-term support from a behaviourist, even if it means after the current firework period. Benzodiazepines have the benefit of providing amnesic effects and can be used either before a predicted event or immediately after an unexpected event12. They should be trialled with enough time before firework period to test for paradoxical excitement, as they may not be ideal for all dogs. Sileo13,14 is licensed for noise sensitivities in dogs but does not have the benefit of amnesic properties. Dogs being supported through a long-term behaviour modification programme may still require anxiolytic medication annually to control the dog’s emotional response to fear-inducing noises, and as a safety net to prevent relapses in dogs after completion of a behaviour modification programme. There is little evidence in the efficacy of nutraceuticals, herbal scents, supplements or herbs for firework fears and phobias so it is important that use of these products as a first attempt is not a substitute for behavioural therapy. Desensitisation and counter-conditioning have been shown to effectively reduce signs of fear of fireworks in dogs15. Owners must understand the principles behind desensitisation and counter-conditioning and recognise signs of fear. If the dog is not in a parasympathetic state during controlled exposure to noises, it is likely to become more fearful. In my experience, owners will often have attempted some form of their own version of desensitisation and counter-conditioning and the problem has – at best – shown no improvement, and at worst the dog has actually ended up more sensitised to noises. Typical problems encountered include dogs that are extremely sensitive even to recorded noises played on a very low volume, and dogs that ignore artificial sounds even when played at the highest volume. Long-term medication should not be used unless alongside a behavioural modification programme. It is therefore best to refer cases to a qualified behaviourist who can develop an individualised treatment plan for the dog in question, and provide the necessary support for the clients. Clinical and Veterinary Behaviourists may be found on the Animal Behaviour and Training Council website (www.abtcouncil.org.uk). Aim to start your marketing initiatives in early spring to allow a realistic timescale even for short-term management advice. This might be in the form of an email newsletter concentrating solely on firework advice, inviting clients who have previously purchased anxiolytic products around firework period to open information clinics, or perhaps a client information evening (contact your local behaviourist and I am sure they will be happy to collaborate with you!). Veterinary staff can be at the forefront of ensuring the welfare of dogs is improved by providing appropriate preliminary advice and encouraging referral as necessary. Blackwell, E. J., Bradshaw, J. W. S. & Casey, R. A. (2013) Fear responses to noises in domestic dogs: Prevalence, risk factors & co-occurrence with other fear related behaviour. Applied Animal Behaviour Science, 145, 15-25. Dale, A. R., Walker, J. K., Farnworth, M. J., Morrissey, S. V. & Waran, N. K. (2010) A survey of owners’ perceptions of fear of fireworks in a sample of dogs and cats in New Zealand. New Zealand Veterinary Journal, 58, 286-291. Blackwell, E. J., Casey, R. A. & Bradshaw, J. W. S. (2005) Firework fears and phobias in the domestic dog. RSPCA, University of Bristol. Gehring, R. (2006) Review of firework exposure and treatment. Unpublished final year dissertation, Royal Veterinary College. Fagundes, A. L. L., Hewison, L., McPeake, K. J., Zulch, H. & Mills, D. S. (2018) Noise sensitivities in dogs: An exploration of signs in dogs with and without musculoskeletal pain using qualitative content analysis. Animal Behaviour & Welfare, 5, 1-5. Bowen, J. (2010) Behaviour: Firework Fears and Phobia. Companion Animal, 13, 59-63. Hargrave, C. (2014) Pheromonatherapy and animal behaviour: providing a place of greater safety. Companion Animal, 19,60–64. Landsberg, G.M., Beck, A., Lopez, A., Deniaud, M., Araujo, J. A. & Milgram, N. W. (2015) Dog Appeasing Pheromone collars reduce sound-induced fear and anxiety in beagle dogs: a placebo-controlled study. Veterinary Record, 177, 260-266. Bowen, J. & Heath, S. (2005) Behaviour problems in small animals: Practical advice for the veterinary team. Elsevier Health Sciences. Limura, K. (2006) The nature of noise fear in domestic dogs. MSc Thesis, University of Lincoln. Crowell-Davis, S. L., Seibert, L. M., Sung, W., Parthasarathy, V. & Curtis, T. M. (2003) Use of clomipramine, alprazolam and behaviour modification for treatment of storm phobia in dogs. Journal of the American Veterinary Medical Association, 222, 744-748. McPeake, K., Nadja, A. & Mills, D. (2017) Noise sensitivities in dogs: a new licenced treatment option. Veterinary Record, 180, 353-355. Levine, E. D., Ramos, D. & Mills, D. S. (2007) A prospective study of two self-help CD based desensitisation and counter-conditioning programmes with the use of Dog Appeasing Pheromone for the treatment of firework fears in dogs. Applied Animal Behaviour Science, 105, 311-329.